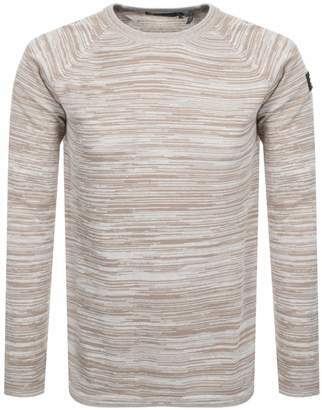 G Star Raw Core Knit Jumper In A Sahara Beige And Ivory Dry Tone Cotton, A two toned cotton knit jumper in cream and beige with a ribbed knit crew neck and long raglan sleeves and elasticated waistband. The signature G Star Raw logo stud is situated on the upper left sleeve in black. Stitch detailing in beige. 100% Cotton. Brand New G Star Raw Jumpers And Zip Tops Live Online.